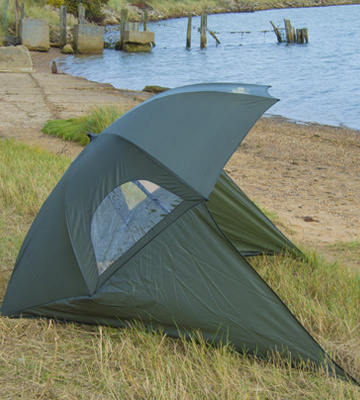 Being able to turn from flat to ready to go in a matter of a few minutes, this device would be better described as a tent, and, thanks to the zip-attached side walls (that, on top of everything else, also include windows), this Ultra fishing umbrella will be able to work as a modern and accessible means of shelter. Putting the entire thing into the bag can be quite troublesome. 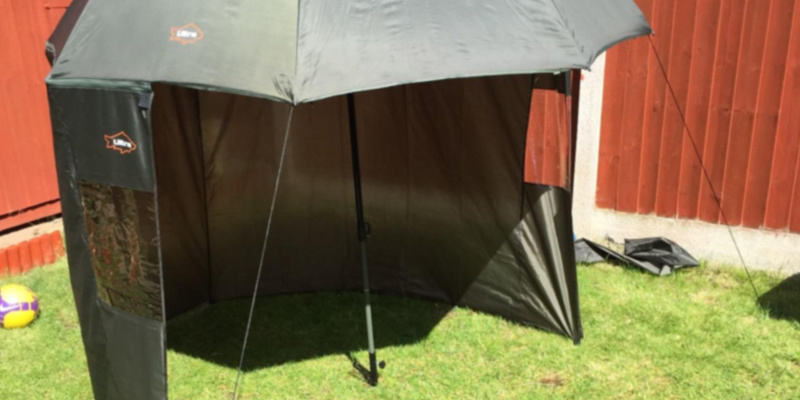 Ultra Fishing Angling 2.2m Umbrella doesn't have too many real rivals on the market thanks to the kind of coverage it boasts with the help of pegs included in the package in order to anchor the tall walls of this tall model to the ground. 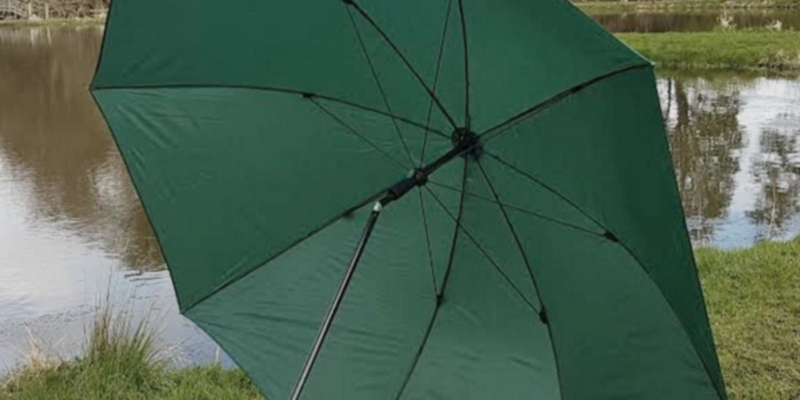 The device in question isn't just a fishing umbrella but actually what is referred to as a fishing brolly system meaning that it won't just cover you from sun and rain the way a regular umbrella would but also will be able to ensure a virtually perfect protection against the wind, the rain during those windy days, and even the snow. The mounting ropes are fairly thin and tend to wear out soon. 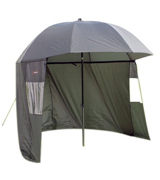 The Carp-Corner 183799 will be a great fit for those fishing aficionados that would like to be protected against virtually any kind of weather and don't want to waste a tremendous amount of time on putting the umbrella up. The umbrella comes equipped with a top tilting mechanism and windows on the side, making it a perfect mixture between the bigger and less compact brolly kinds of umbrellas and some of the simpler ones that are often unable to offer a sufficient amount of cover and protection. The paint tends to fade away after some time. 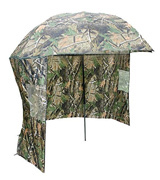 Michigan Fishing Umbrella Shelter is one of the more versatile options on the market that should be able to satisfy the customers looking for a multifunctional and flexible device. 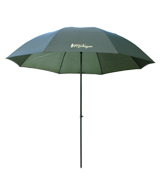 The model will be able to protect you from any kind of rain thanks to the curved design of the canopy. Not to mention that, with an angle tilt and an adjustable ground spike, you will be able to place this model any way you desire in order to maximise the comfort and the efficiency of your fishing. 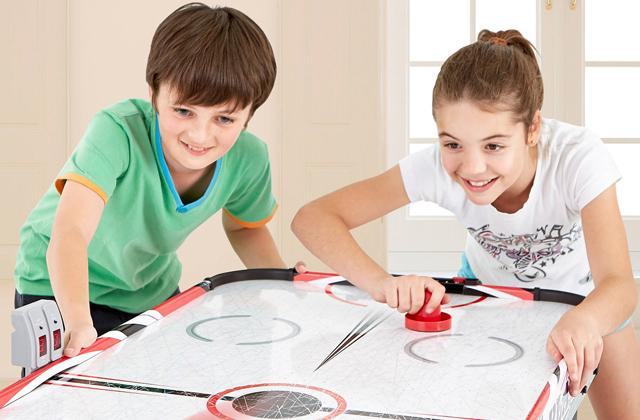 The tilt mechanism leaves a bit to be desired. If you're one of those fishing aficionados that prefers to employ the so-called method of angling in your hobby, the Bison sx25 is without a doubt the kind of model you ought to look out for. 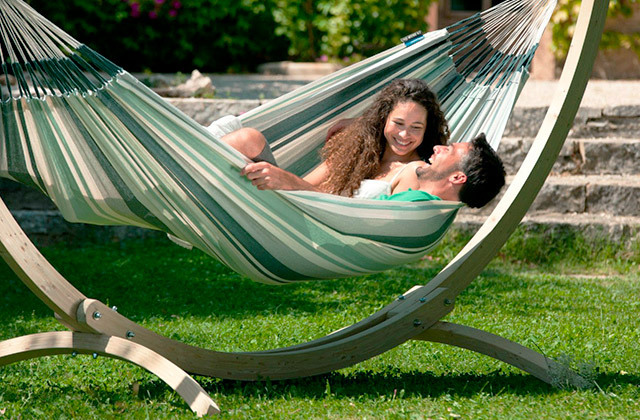 The canopy is made of waterproof 210T polyester fabric and manufactured mostly with the help of black coated steel. On top of that, the company includes a free carry bag with every single umbrella making the transportation process ever so simple. 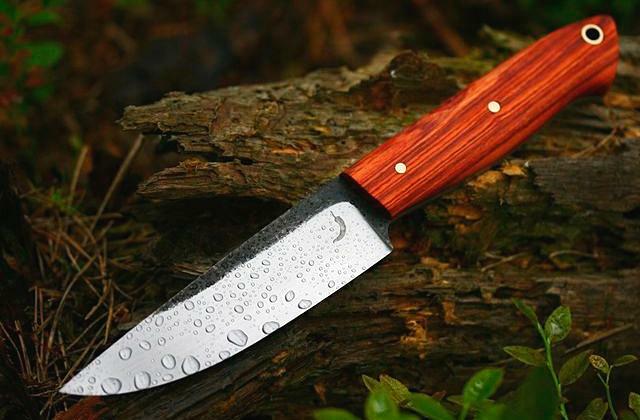 Won't protect you against the rain on windy days. 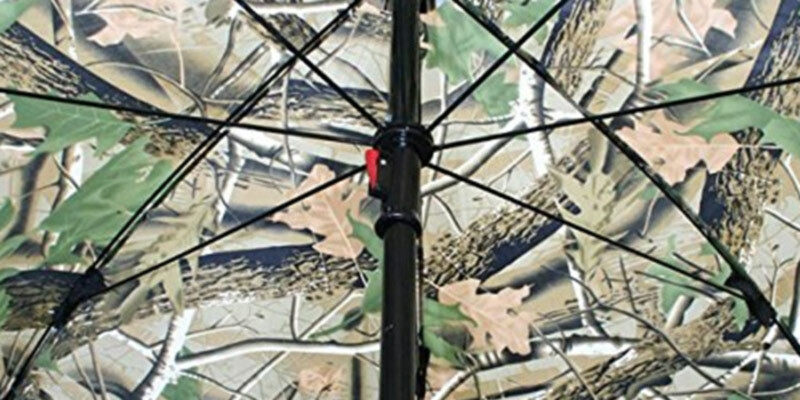 If you're interested in a basic fishing umbrella comprised of dependable and reliable materials that will be able to last a decade, you simply cannot go wrong with the Michigan Fishing Umbrella. Every once in a while, there comes along a product that redefines the way people look at other different products of this category. And although without being able to access the wisdom of hindsight, it can be next to impossible to predict if that is going to happen to any particular item, the Ultra Fishing Angling 2.2m Umbrella would certainly have to be our best bet when it comes to reimagining the way we look at fishing umbrellas. To start with, calling what we have on our hands any sort of umbrella would be an understatement, to say the least. 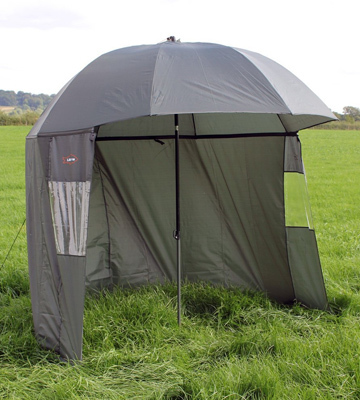 Being able to turn from flat to ready to go in a matter of a few minutes, this device would be better described as a tent, and, thanks to the zip-attached side walls (that, on top of everything else, also include windows), this Ultra fishing umbrella will be able to work as a modern and accessible means of shelter. As it is stated in its very name, this model is 2.2m tall, which suggests that it will be a good fit even for some of the tallest fishing aficionados. But if you feel like that is a bit too tall for your taste, you can easily adjust the height of this product and the angle with the help of multi-angle tilt function. 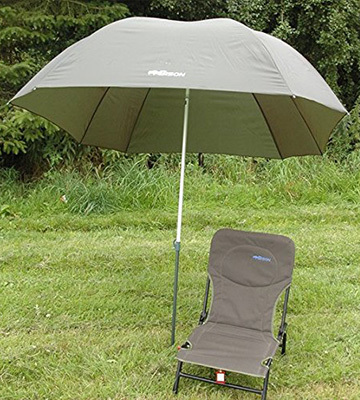 While calling this model the absolute best fishing umbrella may be a bit of an exaggeration, let's just state that the Ultra Fishing Angling 2.2m Umbrella doesn't have too many real rivals on the market thanks to the kind of coverage it boasts with the help of pegs that are included to anchor the tall walls of this tall model to the ground. From the product that goes by the name Carp-Corner 183799, what you might expect is a carp fishing umbrella. 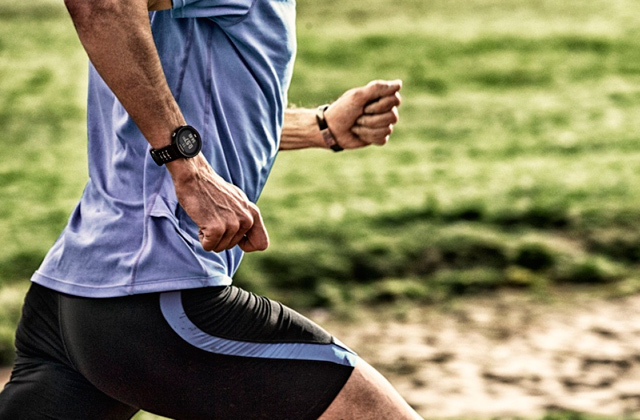 And while that's not necessarily false, this model is so much more than that. First of all, the device in question isn't just a fishing umbrella but actually what is referred to as a fishing brolly system meaning that it won't just cover you from the sun and rain the way a regular umbrella would but also will be able to ensure a virtually perfect protection against the wind and rain during those windy days, and even the snow. The model comes supplied with wire pegs and guy ropes meaning that it will be incredibly easy to set the whole thing up and no kinds of weather conditions will be able to rattle the structure of your cover. 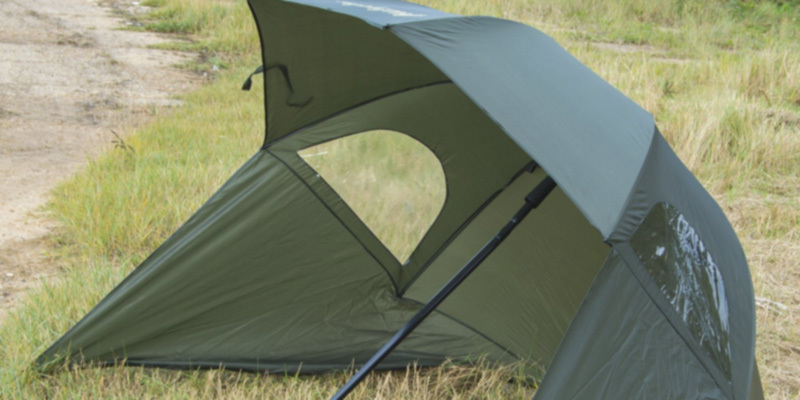 On top of that, the model features almost two metres in the tip to tip diameter so you won't have to worry about having enough space for you under this large fishing umbrella. And the last but not least, this product is painted with a camouflage type of image meaning it will be able to blend in without disrupting the scenery. 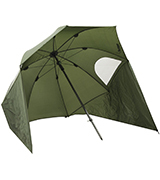 All in all, the Carp-Corner 183799 will be a great fit for those fishing aficionados that would like to be protected against virtually any kind of weather and don't want to waste a tremendous amount of time on putting the umbrella up. 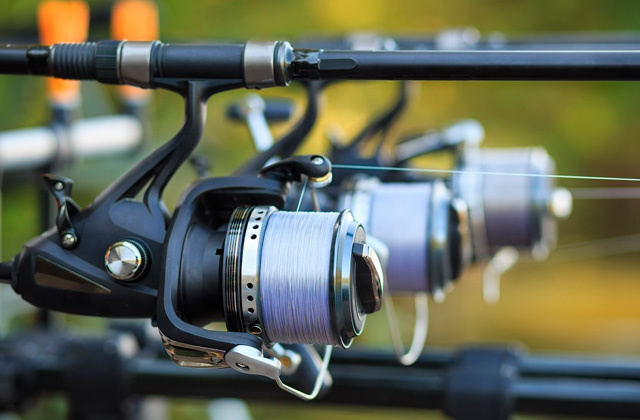 Since fishing is one of those activities that people generally tend to engage in outside of the comforts of their own home, you never really quite know what kind of equipment you ought to bring with you. When it comes to a fishing umbrella, some of the times all you'll need is a basic version of this equipment and some of the massive ones simply won't do. While other times, a simple model will not suffice and you will require some form of shelter in order to cover from whatever it is the weather decided to throw your way. If that ever happened to you, Michigan Fishing Umbrella Shelter should be right up your alley. 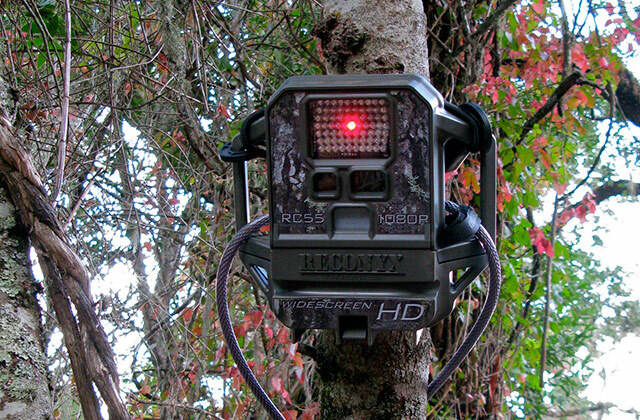 Thanks to a specific design of this product, the model is ideal for all sorts of fishing. You will be presented with an opportunity to adjust the height of the umbrella however you desire. 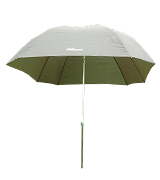 Additionally, the model comes equipped with a top tilting mechanism and windows on the side, making it a perfect mixture between the bigger and less compact brolly kinds of umbrellas and some of the simpler ones that are often unable to offer a sufficient amount of cover and protection. Furthermore, the model in question is rather sturdy thanks to the fact that it comes included with pegs and guy lines. 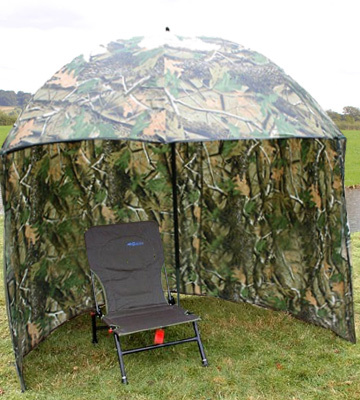 In conclusion, Michigan Fishing Umbrella Shelter is one of the more versatile options on the market that should be able to satisfy the customers looking for a multifunctional and flexible device. 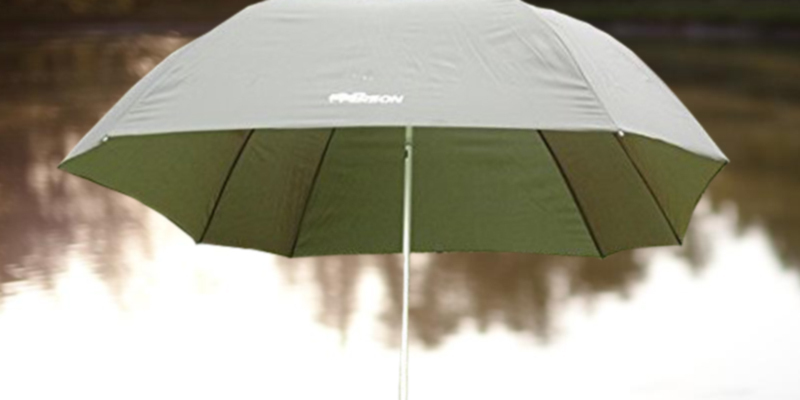 The Bison sx25 is the kind of fishing umbrella that will easily and effortlessly be able to catch off guard even the most experienced fishing enthusiasts that have used a fairly large variety of different kinds of umbrellas over the places. 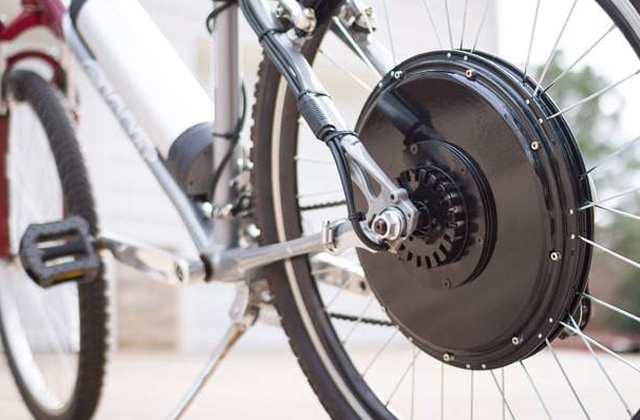 If we were to try to describe this product, it will surely first seem and sound like one of the more basic models out there. But don't let that first impression fool you. While this isn't one of those brollies that features walls with windows on the sides, it will be able to protect you from any kind of rain thanks to the curved design of the canopy. 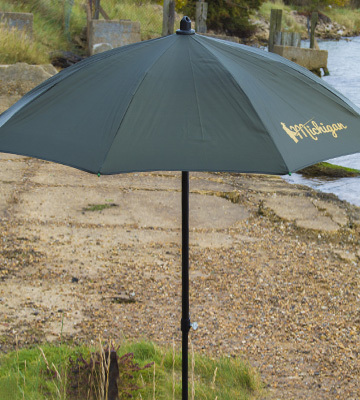 That, along with the fact that this is one of the taller models out there, featuring more than 2.5 metres in height, makes this fishing umbrella a perfect choice for an angler. Not to mention that, with an angle tilt and an adjustable ground spike, you will be able to place this model any way you desire in order to maximise the comfort and the efficiency of your fishing. The last advantage of this product that we would like to recognise would be the fact that the canopy is comprised entirely of polyurethane coated nylon, meaning that it will be able to provide considerable durability despite being one of the more lightweight fishing umbrellas on the market. So if you're one of those fishing aficionados that prefers to employ the so-called method of angling in your hobby, the Bison sx25 is without a doubt the kind of model you ought to look out for. 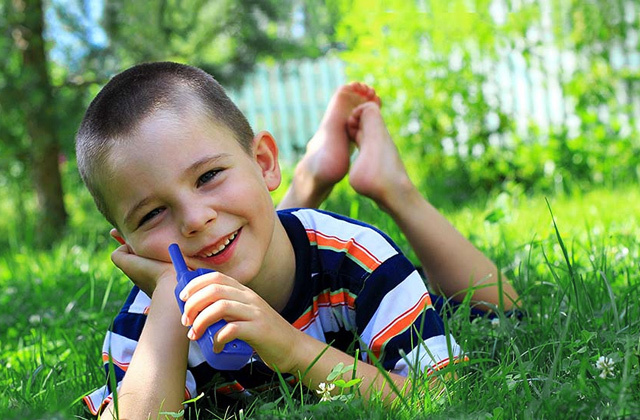 Even though a fishing umbrella is one of the more simple devices out there, therefore unlikely to cost a potential customer an arm and a leg, people still tend to look for the kind of product that will be able to last them for years to come. 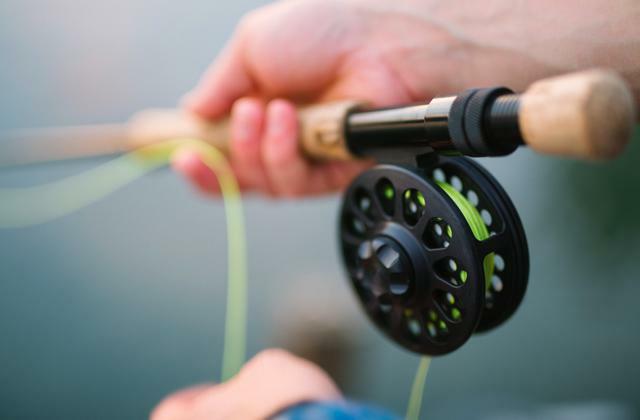 And when it comes to fishing equipment and accessories, there are very few companies capable of rivalling the quality and consistency of that quality of the MICHIGAN®. Michigan Fishing Umbrella is, of course, no exception to the previously mentioned rule. Even though it is certainly one of the more basic options on the fishing umbrella market, the model manages to stand out in terms of stability and security. With the canopy made of waterproof 210T polyester fabric and the manufactured mostly with the help of black coated steel, you can rest assured knowing that the model will be able to serve you for as long as you want. Thanks to the top tilting mechanism, you will be able to easily adjust the angle of your umbrella. And if you're still not sure whether this is the right fit for you, the company includes a free carry bag with every single umbrella making the transportation process ever so simple. So if you're looking for a basic fishing umbrella comprised of dependable and reliable materials that will be able to last a decade, you simply cannot go wrong with the Michigan Fishing Umbrella. What Is a Fishing Umbrella? 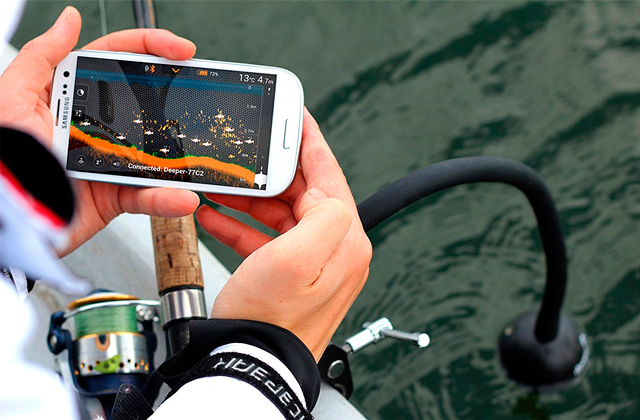 Out of a ridiculously large variety of activities all around the world that people are engaged in right now or have been preoccupied with for the past years, decades, centuries, and even millenniums, there are very few that could possibly hope to rival fishing when it comes to popularity over the time spent on it. And that's not particularly surprising given that the kind of peacefulness and tranquillity fishing can bring you, combined with the ability to actually catch your own delicious food, is something that not a lot of hobbies can brag about. The only real downside to fishing, as far as we can tell, is that you never really know what kind of weather conditions you're going to face going fishing. And that is where a fishing umbrella comes in. With a fishing umbrella, you wouldn't have to worry about what kind of rain you are potentially facing and, with some models having side walls, even the strongest of winds would fail to disrupt your fishing experience. 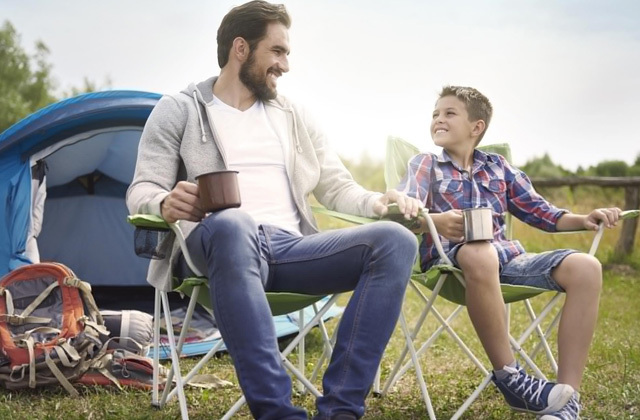 If you take your fishing seriously and a fishing umbrella simply will not suffice, we suggest you look into our reviews of camping tests useful for overnight fishing or boats that may come in handy if you wish to take it to the next stage. 1.Chris Collins What's The Best Short Session Shelter? AnglingDirect. May 29, 2014. 2. Walker Smith How to Get More Out of Your Umbrella Rig, Scout. January 7, 2014. 3. Tom Gatch Catch More Fish with an Umbrella Rig, ThoughtCo. March 06, 2017. 5. 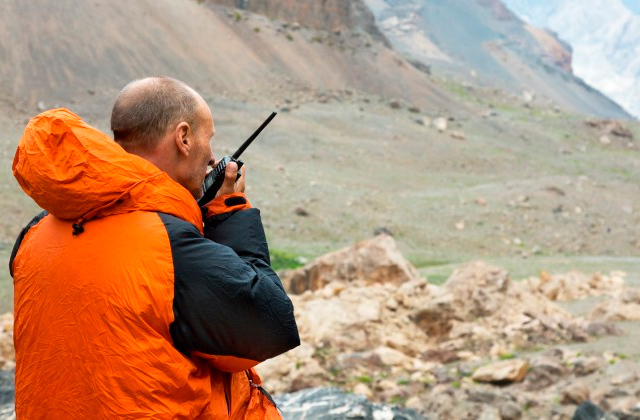 How to Choose Bivy Sacks, REI.com.